Last night showed the first episode of a two part special starring Martin Clunes as he investigated the history of dogs, Martin Clunes: A Man and his Dogs. 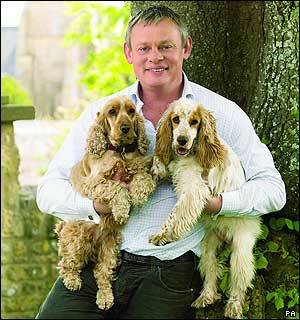 Clunes has always lived with dogs and the programme originated from his own curiosity about where they came from. He currently lives with two cocker spaniels and a black Labrador. In a similar discussion to the BBC’s Pedigree Dogs Exposed programme last weekend, Clunes opened the programme talking about how we have meddled with the dog’s breeding to generate so-called pedigree dogs. He claimed that the history of most dogs cannot be traced back more than five generations, no matter how illustrious the pedigree. According to the programme, no matter what dog you have, whether pedigree or mongrel, no matter what breed or cost, they all share the same genetic blueprint, which is 99.8 per cent the same DNA as a wolf. To begin, Clunes travelled to Yellowstone Park in Wyoming to see wolves. To me, the principal difference between wolves and domestic dogs is that dogs seek out our company and wolves don’t. 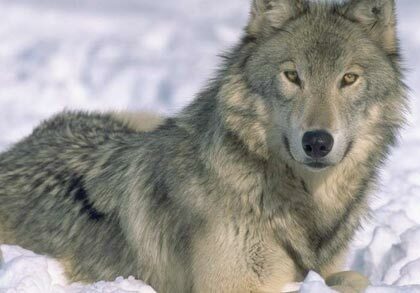 We were told that the best chance we’d get of seeing them was in Yellowstone Park where we found a pack around a kill. We couldn’t see them with the naked eye but with our telescope we could see them just mucking about and playing, which was a real privilege. One animal behaviourist in Devon, Shaun Ellis, has reared six wolves in captivity and has lived with them for eighteen months so they now see him as part of their pack. The litter of six pups were born in 2004 in another animal park and were abandoned by their mother. According to Ellis, whether you walk on two legs or four, they do not seem to see the person, but only position you hold in the pack. They love and respect the position you hold in the pack, and that is the same for the domestic dog. At home, you should be the alpha or beta dog and the dog should know that he has the lowest position in the pack, below all family members. Although it may not be how we like to see it, it is not us as a person that the dog loves, but your position and if that position changes, then his feelings will also change accordingly. It was interesting to see how wolves act as a pack and how that has filtered down to the domestic dog. Ellis demonstrated how the first wolf to approach is the ‘enforcer’ of the pack, responsible for discipline in the pack. Often, when someone chooses a puppy from the litter, they will choose the one that came forward. The puppy they have just chosen is the enforcer. Clunes also visited Australia to question how we have adapted and bred wolves and domestic dogs to get modern pedigree breeds such as the Shih Tzu or the Spaniel. Dingoes are believed to have descended from Asian wolves and to have arrived in Australia in approximately 3000 BC. Man adopted the dingoes as companions and over time, the dogs grew smaller, to a size better suited as companions to humans. Clunes visited Fraser Island, where there are no dogs, and hence the breed there are pure dingoes, the breed described as the missing link between the wolf and the modern dog. As Clunes commented, originally there was only one shape of dog before we shaped them. As he watched the dingoes on the island, he commented that it was easy to forget they are wild animals because they do look just like a dog, and it was difficult to not be tempted to try and stroke them. 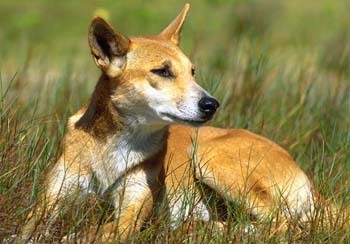 However, like wolves, dingoes are wild animals and wary of humans. The documentary went on to say it was easy to see how the contract between man and dog was started all those years ago. For the dog, man represented fire, security and companionship and for the man, the dog helped to hunt for food and stand guard over our goats and sheep. It is now that the programme turns to a discussion similar to that of the BBC’s Pedigree Dogs Exposed documentary last weekend and asked the question: What terrible biological tricks did we play on our partner? To help answer this question, Clunes visited a taxidermist to see, as the documentary put it, how humans have engineered and interfered with dogs, playing God with evolution. Breeders experimented with dogs by trial and error, allowing those certain individual dogs with the desired characteristics to survive. Amongst those traits were the cute and cuddly for companions, speed for hunting and aggression to kill. For example, the Basset hound was bred as a scent dog, able to sniff out prey, yet with small enough legs that they could not move too quickly – ideal for a hunter on foot. 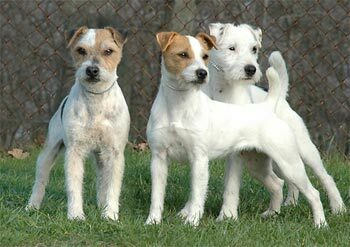 Terriers were bred to be aggressive. They are ‘designed’ to be small, quick and relentless. The natural killer instinct, only used by wolves when hungry, was exaggerated to enhance. Clunes paid a visit to farmer Andy Crowe to watch three Jack Russell terriers used to kill rats and cure a farm of its rodent infestation problem. As the farmer pointed out, this breed is ideal to quickly grab and kill rats. The terrier was bred for this and to kill small, furry animals is its natural instinct. He joked that one of his terriers had killed his daughter’s gerbil. Apparently, it takes only seven generations to change the form of a dog to enhance the traits we desire. The first episode concluded that we have such a strong connection with dogs because of their strong sense of ‘pack’ or family. It summarised that there is only a fine line between the domestic dog and its wild ancestors. The relationship between man and dog has endured for so long. Naturally, as the first programme has explored where the dog has come from and so the next natural question is ‘where are dogs going now?’ and this will be the subject of the concluding episode. The second part of this exploratory documentary will be aired next Sunday at 9pm ITV1. There will reportedly be a book to follow the programme. I have been trying to contact Martin Clunes following his recent excellent for Hearing Dogs for Deaf People. I am myself profoundly deaf and a recipient of Hearing Dogs for the past fifteen years. I also happen to be an ex-professional actress and a now-retired lecturer in Theatre Arts with my dogs specially trained to accompany me to theatres. My current dog is well-known to both the RNT and the Old Vic. I m trying to raise awareness amongst the theatrical profession of the work of these dogs and would welcome his support in this respect. Please may I have a more direct emailable address?